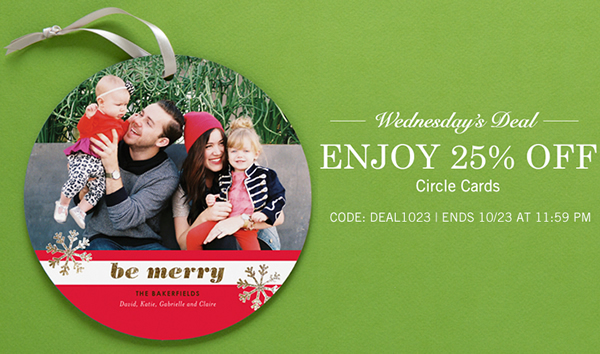 From now through 10/01/13, get 20% off all Holiday Cards. Just use promo code: 2013HOLIDAY20. Take a little time to browse through all the holiday designs before upcoming Halloween and Thanksgiving overwhelm you. And hey, getting 20% off doesn't hurt right? Click here to see holiday card designs! 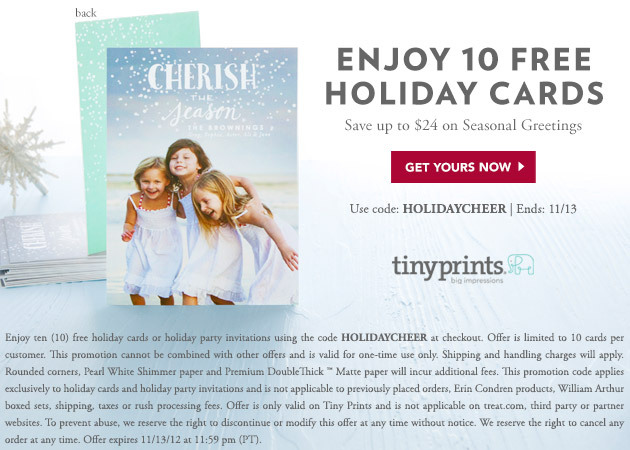 For a limited time, get 10 Free Holiday Cards (a $24.00 value) from Tiny Prints. Use code HOLIDAYCHEER to get yours! This freebie is happening now through next Tuesday 11/13/2012 at 11:59pm PT. This is for flat cards only - options charges will apply (rounded corners/paper options/envelopes options) and shipping charges will also apply. Regular shipping only costs $5.99 in the U.S.
Update (11-12-2012): If customers purchase additional items and spend more than $50.00 they will get FREE shipping using the same code, HOLIDAYCHEER. Not only can you get 10 free cards, but you can also get completely free shipping if you place a small order of $50! What a great incentive! Offer is limited to 10 cards per customer. This promotion cannot be combined with other offers and is valid for one-time use only. Shipping and handling charges will apply. Rounded corners, Pearl White Shimmer paper and Premium DoubleThick ™ Matte paper will incur additional fees. This promotion code applies exclusively to holiday cards and holiday party invitations and is not applicable to previously placed orders, Erin Condren products, William Arthur boxed sets, shipping, taxes or rush processing fees. Offer is only valid on Tiny Prints and is not applicable on treat.com, third party or partner websites. To prevent abuse, we reserve the right to discontinue or modify this offer at any time without notice. We reserve the right to cancel any order at any time. Offer expires 11/13/12 at 11:59 pm (PT).